Based on the Greek god Hermes, the myth of Mercury tells of a precocious infant, given to mischief and practical jokes. He was, however, always able to talk his way out of real trouble and turn his inquisitors into friends. He made the first lyre and used its beautiful tunes to spellbind his adversaries so that they completely forgot their anger. One of his most infamous incidents was when he stole the cattle that belonged to Apollo. Being none too happy about it, Apollo hauled Hermes up to Mount Olympus to be put on trial. Zeus found the story so amusing that he did not punish Hermes. Regretful of what he had done, Hermes gave Apollo his lyre as a present. The cattle were returned to Apollo and all was well again. Hermes was a delight to his father, Zeus, who gave him a golden hat with wings and a pair of winged sandals so that he could move from place to place in a flash. He was made herald of the gods, charged with delivering messages from one to the other. Mercury is the Roman name for the Greek god, Hermes. 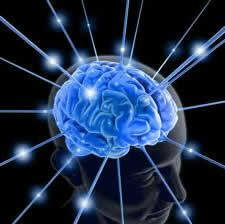 Mercury represents all aspects of the thinking process. The magic of words and the wonder of ideas is at its core. Mercury is our ability to reason, to think things through, to plan our future. 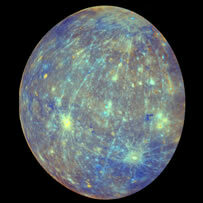 Mercury is also in charge of the nervous system, whose job it is to send messages from one part of the body to another. 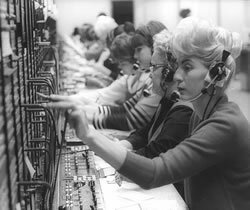 Like telepone operators of days gone by, our brains are constantly directing responses to the jumble of messages the come in through our sensory organs -- our eyes, ears, nose, mouth and skin. How we make sense of our world from those complex, rapidly changing, and often conflicting sensory signals is defined by the sign and house position of Mercury. As the planet closest to the Sun and inside the orbit of Jupiter, it is classified as one of the Personal Planets. Mercury is never more than 28 degrees away from the Sun, so it can only be in the sign before the Sun, the same sign, or the sign after the Sun. It's sign shows HOW you think, what your logical process is. When Mercury in the same sign as the Sun, it shows a stronger focus on achieving the ambitions described by your Sun sign -- you know how to get where you want to go. In one of the other signs, it broadens the range of your ambitions. It's house position in your chart shows what sort of things interest you and what you want to spend your life thinking about. It is significant that our method of thinking is tied so closely to our sense of identity...we are who we think we are. Mercury is the fastest moving planet in our solar system, taking slightly under 89 days to complete it's orbit around the Sun. A Mercurial year is completed in only three of our earth-months. It normally spends about two weeks in each sign, but when retrograde events happen, this can be extended to five or six weeks. Mercury turns retrograde three times a year. Each retrograde period last for about three weeks.